This week I read my second Ron Rash novel of the year, Above the Waterfall. I got through it in two days—it's excellent. Like most of Rash's fiction, Above the Waterfall takes place in the western North Carolina mountains, but unlike his historical novels Serena, One Foot in Eden, and The Cove, this story takes place in the present: a horribly real, recognizable present. This is the Appalachia of dependence—on distant relations to care for the children of failing families, on big-city resort developers and tourist dollars, on chemicals like painkillers, pot, and meth. Les, a 51-year old Sheriff on the verge of retirement, and Becky, a middle-aged park ranger and Les's sometime romantic attachment, narrate the story in alternating chapters of present and past tense. Becky survived a school shooting as a girl and is still haunted by it in her mid-forties. She tries to dull the memories of the tragedy, her permanently disrupted family life, and her difficulty forming relationships by retreat into the wilderness and meditation on the beauty of the world. A devotee of Gerard Manley Hopkins, her chapters brim with his kind of allusive, fragmentary poetry as she pieces together her memories with her present struggles, particularly her difficult feelings for Les and the pain of a recently failed relationship with another nature lover, a man who turned out to be an eco-terrorist. While Les is an artist too—a painter of watercolors—his career in law enforcement has imparted to his narration a directness that sits uneasily with his artistic inclinations. After decades arresting drug addicts and wife beaters, identifying corpses, and bearing bad news to the parents of meth-addicted children, his matter-of-factness even seems like a coping mechanism, as if he can only deal with the horrors he sees by describing them without polish. What unites Les and Becky, other than a brief fling, an interrupted love affair, is an elderly man named Gerald. Becky has struck up a friendship with Gerald who, bereft of his wife and only son, lives alone on ancestral land abutting a new but struggling mountain resort. Gerald's meth-addicted nephew takes advantage of his generosity every chance he gets. While Becky tries to help Gerald however she can, Les, pestered by the resort's owner, has to try to persuade Gerald not to poach the trout living in the resort's stretch of the creek that flows through both properties. The morning after an altercation in the resort parking lot that almost sends Gerald to the morgue, scores of fish wash up on the banks of the creek—poisoned with kerosene dumped into the stream above a waterfall where, according to Gerald, now rare speckled trout have returned. Gerald insists he's innocent, and Becky takes his side. Les, juggling the resort's problems and a harrowing series of meth busts, is just trying to keep the peace during his last days on the job. It's not enough. This is my new favorite from Rash. What gripped me in my old favorite, One Foot in Eden, were the strongly drawn relationships—between the young couple at the beginning of the book, between the couple and a roguish neighbor, between the couple and their son many years later—and the threats that tested them—betrayal, adultery, lies, murder. Above the Waterfall shares these strengths but outdoes One Foot in Eden. With its cast of middle-aged characters, each of whom harbors hurts and secrets, each of whom struggle to overcome past sins and earn forgiveness, and with its setting in a dying world, this novel adds a thick layer of poignancy and theologically inflected melancholy. It moved me, and it made me think. The next morning as I'd hiked out, I started to step over a log but my foot jerked back. When I looked on the other side, a copperhead lay coiled. Part of me not sight knew it was there. The atavistic like flint rock sparked. Amazon tribes see Venus in daylight. My grandfather needed no watch to tell time. What more might we recover if open to it? Perhaps even God. Last week I reviewed the Finnish film Talvisota (The Winter War) for Historical Movie Monday. At the time I had just started reading a novel taking place a year and a half after those events: Väinö Linna's Tuntematon sotilas, or Unknown Soldiers in its most recent English translation. I finished it earlier this week. 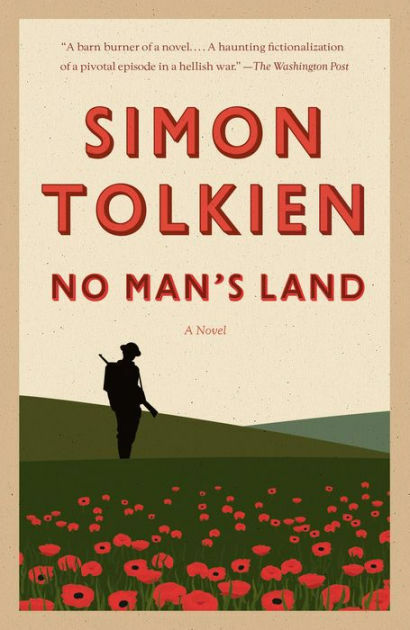 It's one of the best war novels I've ever read. Unknown Soldiers follows a company of Finnish machine gunners through the Continuation War, from the beginning in the summer of 1941 to ceasefire in September 1944. The Finns coordinated their invasion of Soviet Russia with the German invasion, Operation Barbarossa, making the Finns ostensible German allies though they were never fully incorporated into the Axis. The goal was to recapture land taken from Finland by the Russians during the Winter War and occupy other territory to be used for postwar bargaining following German victory. None of this matters to the characters in Linna's novel. Not really. They know about most of this political background and occasionally discuss it, but their war is earthy, small-scale, and intensely personal. They are less concerned with Hitler's eventual success against Stalin than with how to handle the weight of a machine gun while marching, how to get enough to eat, how to make some extra cash while the war keeps them from home, how to keep out of the way of officers, and how to stay alive. The novel begins and ends with the war. After a brief introduction to most of the major characters—there is no single "main" character—the machine gun company assembles and boards trucks for the front. They don't know where they're going or why at first, and a brief passage on God's destruction of a patch of forest through a wildfire is the last bit of omniscience we'll get until the very end. We experience the fog of war with the characters, seldom knowing any more than they do and taken by surprise just as often as they are. The characters are wonderfully drawn, and have apparently become bywords for particular kinds of people in Finland. Linna ranges up and down the chain of command, giving us moments with everyone from the company commander to new privates who arrive at the front a few years in. Lieutenant Lammio, a potential martinet but otherwise harmless, becomes company commander after the respected previous commander is killed just a few days into the war; in his new position, his negative traits come to the fore. Ensign Kariluoto, another officer, is naive and detached and has the novel's only real love story, budding from his infatuation with Sirkka, a hometown girl. There's Hietanen, a bluff, good-humored jokester who is nevertheless painfully shy around women, and Vanhala, a giggler, both of whom sober up over the next three years, especially as they rise to positions of leadership and find themselves tested. Lehto is aloof, a gruff, tough fighter, and Määtä, a short, quiet man, never shirks from hauling his squad's machine gun, quietly earning the respect of every man in the company. Lahtinen is a communist sympathizer who, like most Marxists, annoys his friends by interjecting mindless revolutionary formulae into ordinary smalltalk. Honkajoki is an eccentric trying to build a perpetual motion machine and who carries a bow and arrows. Mäkilä, the company quartermaster, is obsessively stingy with the men's gear: "He kept the shelves in impeccable order," Linna tells us, "stocked with all the finest equipment, unmarred by any worn-out items—which he distributed to the company." The novel is also, I should point out, wryly funny. My two favorite characters were Rokka and Koskela. Antero "Antti" Rokka is an older man—in his early- to mid-thirties—a husband and father, a veteran of the Winter War, and a refugee from Kannas, part of the Finnish territory taken by the Russians. He has the most personal stake in the success of the invasion, and only when it becomes clear, in the last quarter of the book, that he'll never see his old farm again is his chipper, folksy demeanor shaken. He has no time for formalities and routinely offends superiors with a knowing "Lissen here." He is also the best soldier in the company, never shrinking from combat, and, in one famous episode, ambushing and wiping out a platoon of more than fifty Russian soldiers with just his submachine gun. (This incident, far from being a proto-Rambo bit of action, is based on an actual incident in which a soldier named Viljam Pylkäs gunned down over eighty Russians.) By the end of the novel, when he's one of the only major characters left, I really dreaded for his safety. Koskela, on the other hand, is an officer who achieved his rank through merit, during the Winter War. He's strong, silent ("quiet Koski" is a nickname used a few times throughout), courageous, leads by example, loved by his men—all the qualities of a Greek hero without the arrogance or ostentation. As a leader, he also sets himself apart through the crucial ability to know what matters and what doesn't, an ability Lammio, who tries to court martial Rokka at one point, lacks. When leadership of the company finally devolves onto Koskela at the end of the book, as the Finns retreat from Russia and face encirclement, Koskela acts quickly and decisively and his men follow. 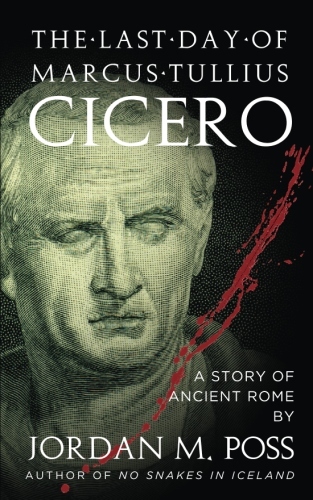 It's a really stirring portrait of manhood and leadership. It was as if his entire consciousness had been frozen. It refused to consider the significance of these angry blasts, as if shielding itself from the terror such considerations would induce. Hietanen darted quickly behind the upturned roots. Just then he heard Rokka's voice yelling, "Now shoot like hell!" Hietanen was panicked and trembling with anxiety. The urgency ringing in Rokka's cry struck his over-excited consciousness as a warning of some new, unknown danger. Then he realized that the call was intended for the others. It occurred to him he did not know if the mine was functional or not. He didn't know anything about it except that it was supposed to explode under pressure. It was a little late for sapper training, however. The time was now or never. A vision of the tank tracks rolling beneath their fenders flashed through his mind. Right there ... right there ... And then he threw. 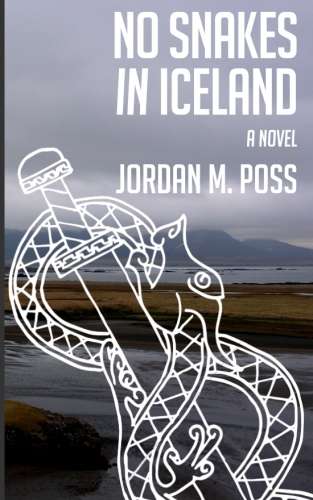 The weight of the mine made aiming next to impossible, and a kind of prayer-like wish flickered through Hietanen's consciousness as he hurled it. . . . Only then did the precariousness of his own position suddenly dawn on him. Would the tree base be enough to protect him from the force of the blast? He sank down behind it, opened his mouth and pressed his hands against his ears. Two seconds later, it was as if the pressure of the whole world suddenly descended upon him. He didn't experience the explosion as a sound, but rather as a numbing, thudding blast—and then his consciousness went dim. When it returned, he saw that the vehicle was still, titled slightly to one side. . . . He just lay there, looking back and forth at the tank, then at the men, who were yelling at him, "Yes, Hietanen! Woo-hoo! Bravo, Hietanen!" The praise was all wasted, however; Hietanen couldn't hear a thing. All the danger, brutality, humor, courage, excitement, dread, horror, irony, and businesslike slogging mirror the war and Finland's role in it. It's excellent. 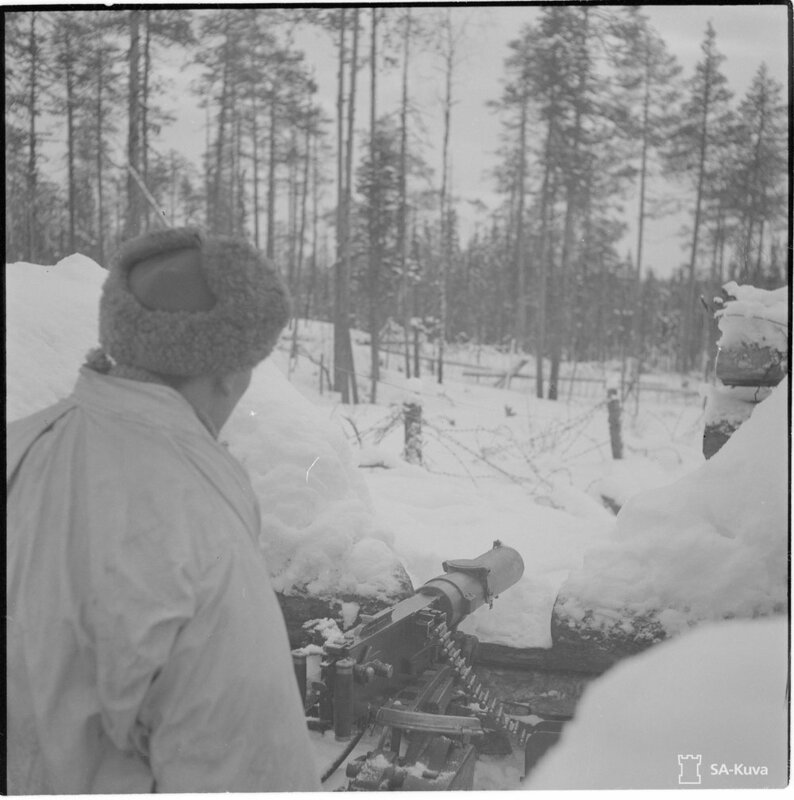 A Finnish machine gun position overlooking no-man's-land, February 1944. Source: SA-kuva, the Finnish Defense Forces Wartime Photograph Archive. I could say more about the plot, but the plot doesn't really matter. The war is, for the characters, a string of violent incidents that gradually winnows and thins the ranks, and that's what Linna, who lived through the Continuation War himself, shows us. He presents military life and war unromantically, as ceaselessly hard work with limited resources, work that can turn deadly with no warning. By the end of the war, even evacuation by ambulance isn't safe. The much-ballyhooed "random" deaths of George R.R. Martin's characters have nothing on Unknown Soldiers, and these soldiers' deaths are the more pitiful when they come because we care so much about them. Unknown Soldiers has a well-deserved place in the pantheon of great war literature. It has the grim, clear-eyed detail of All Quiet on the Western Front and the sense of sheer, exhausting labor of The Naked and the Dead. But the novel Unknown Soldiers reminded me of most was Karl Marlantes's Matterhorn. Like Linna, Marlantes was a veteran of the war he wrote about and based his novel on his own experiences. Like Unknown Soldiers, Matterhorn takes a worm's-eye view of the conflict, bringing the reader into close quarters with a large cast of characters for hundreds of pages. And it's worth the trip. Linna published his novel in 1954. It was first translated into English as The Unknown Soldier in 1957, and again in 2015 by Liesl Yamaguchi, which is the version I read. I neither speak nor read Finnish, but I understand this new translation is more faithful to the original than the first English version. Yamaguchi undertakes the thankless task of communicating the many local dialects and accents of Finnish, and mostly succeeds; Rokka's woodsy twang, to give one example, is instantly recognizable, though some of the others' slangy talk is distracting. There have been three film adaptations: in 1955, a Finnish classic that airs every December on Finnish Independence Day; in 1985; and again in 2017, a version shot using natural light that looks strikingly beautiful. The 1955 original is available in its entirety on YouTube. The newest version is not apparently available on DVD or Blu-ray anywhere yet, but here's the trailer and a clip of Rokka's one-man massacre of that Russian platoon. Charles Portis is one of my favorite authors. He's most famous for True Grit, which is a magnificent novel, but he's also written four other less well-known and appreciated novels. The most recent (published in 1991) is Gringos. 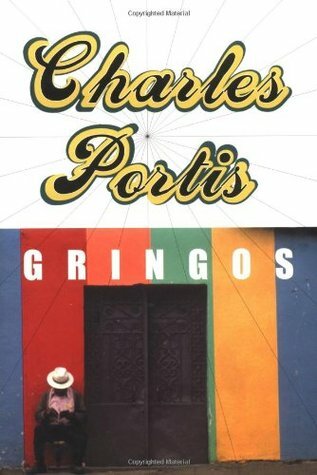 Gringos has a lot in common with Portis's other novels. Like True Grit and The Dog of the South, it's the story of an Arkansas native in exile. Like Norwood, the protagonist finds himself falling in with all kinds of colorful characters and a certain amount of danger he's not really prepared for. Like Masters of Atlantis, the esoteric and occult figure prominently. The main character is an American living in the Yucatan, where he gives guided tours of the jungle and Mayan ruins and occasionally traffics in a little illicit Mayan antiquities. His life is upended by a couple of changes to his circumstances, including love (kind of ?) and the arrival of a band of dangerous hippies who may have something to do with a recent kidnapping in the United States. Simcoe read a book. It was all right to do that here. In the States it was acceptable to read newspapers and magazines in public, but not books, unless you wanted to be taken for a student or a bum or a lunatic or all three. Here you could read books in cafes without giving much offense, and even write them. A passage that should make anyone who has ever read or written along in a restaurant grin. Still, the flying saucer books were fun to read and there weren't nearly enough of them to suit me. I liked the belligerent ones best, that took no crap off the science establishment. Do check out Portis's books; not just True Grit, which is a masterpiece and well worth your time, but his others as well. They're all great, and precious few.